M&M Graphing Activity Kindergarten Homework. LOTS of Fun with M&Ms! It’s summer and as moms we are looking for ways to keep our kids’ minds active in between video games, TV time and outdoor play. One easy way to do this while keeping our children excited is by pulling out the candy. One of our favorite sweet treats that can be used with learning activities are M&M’s®. These are a go to candy in the classroom when it comes to learning about probability and fractions but they can also be great for at home learning. To get us started we created a few printables. You can download these here: M&M’s® Math at Home. We found our M&M’s® Plain at our local Walmart Fresh Market and decided to add a bag of M&M’s® Peanut just for a little variety! For the activities below we used the Plain variety butyou could use the Peanut variety, too! Along with sharing our M&M’s® activities, we are also excited to share information on a daily chance to win a $100 Walmart gift card. First, you will find a page that is designed to help students practice their data collecting skills. Begin by having your children scoop a small handful of M&M’s® and place them in a bowl. We then had our children create a concrete graph by placing the M&M’s® on the graph boxes. (For those of you who aren’t teachers, a concrete graph is simply a graph that uses real items.) Once they completed their graph, we had them count the total number and fill in the spaces at the bottom. Another activity we created are pattern cards. Our kids thought it was fun to use their M&M’s® to complete the patterns on each card. The last set of cards are designed for kids learning to count. You can use these in two different ways. You can use the cards with the M&M’s® images and have your kids match them with the numbers. Or, you can use the blank cards we included and give you children numbers. They then have to place the correct number of M&M’s® on the card. It’s true that our kids loved the M&M’s® activities but while we were at Walmart we also picked up some Life Savers® Hard Candy, Skittles® and a box of M&M’s® Cookie Ice Cream Sandwiches. We have plans to create additional learning materials using the Life Savers® Hard Candy and Skittles® – we are thinking more patterning work would be great for younger children! The M&M’s® Cookie Ice Cream Sandwiches were just for fun and made a great treat on a hot day! We also like the idea of using Skittles® for additional learning during the summer. Younger kids can practice colors and sorting skills by dividing the candies in piles by colors. Another idea is to have children count the number of each color and then practice adding multiple numbers by adding the five numbers. Again, these candies can also be used for creating simple patterns. Older kids can be encouraged to find the percentage of each color in the bag. How would you use Life Savers® Hard Candy and M&M’s® to keep your kids learning over summer? We would love for you to share your ideas! Students imagine they woke up and found $100 under their pillow. They write one or more paragraphs describing what they would do with the money. Includes graphic organizer, writing paper and final copy paper. Pdf format. Students write about how their life will be 100 years from now. Organizers and writing paper to complete the project. Buy some 100 piece puzzles from a dollar store and have the kids work in teams to complete them. Includes graph paper and tally sheet to graph colors of 100 m&ms. Buy one large bag of m&ms and complete the graph together. Have a treat afterwards. 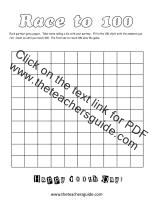 Students fill in missing numbers on a hundred chart to reach 100. 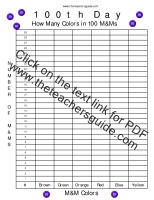 Students fill in missing numbers on a hundred chart and then determine if the numbers are odd or even. 100th Day of School Descriptive Writing. Students write descriptions of 100th Day bottles they create at home. Songs and poems for a 100th Day celebration from CanTeach. Have the kids bring in a collection of 100 items from home (fruit loops, beans, paperclips, etc...), place them in baggies and weigh the collections. EducationWorld has compiled a list of 100 activities to do in honor of the 100th Day of school. Teachersfirst.com has over 50 ideas to help you plan activities for the 100th Day of school. This site charges a membership fee but does provide a few for free. Another membership site that also offers some free resources. 100th Day Race to 100 Students are placed into two teams. They roll the dice on the SMARTboard and flip tiles on the 100 chart. The first team to 100 wins. 100th Day Coin Flip Flip a coin on the SMARTboard 100 times and keep score. 100th Day Incredible Equations Students write equations on the board that equal 100. 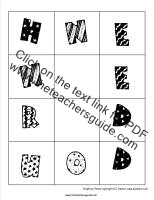 100th Day Puzzle Time Give teams of students 100 piece puzzles. Start the timer to see how long it takes them to complete the puzzles. 100th Day Balloon Pop See how long it takes your students to pop 100 balloons on the SMARTboard. 100th Day 100 Cents Students use coins on the SMARTboard to make 100 cents. Students skip count to 100 by 2, 5, and 10. Gamequarium has a list of interactive sites for celebrating the 100th Day of school. A list of powerpoint presentations for the 100th Day of school. I have tried to limit this list to the few remaining sites that provide free printouts without membership fees or downloading cost. A list of "pay" sites is farther below. 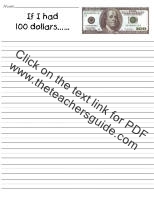 Paper for students to write what they would do with 100 dollars. Students roll dice and write numbers to 100. Students write numbers to 100. Students see how many words they can make with the letters that spell "one hundred." Materials to make a class book. Students draw self-portraits and write about what they will be like when they are 100 years old. Includes cover for classroom publishing. Students write down three clues to help their classmates guess what is in their 100th Day Collection. Teachers can send home with a small paper bag and note explaining what the students should bring in. Have your students make a hat to celebrate the 100th Day of school.